Tempo 40-208 in standard metronome increments (40, 42, 44, 46, etc).- 39 steps. 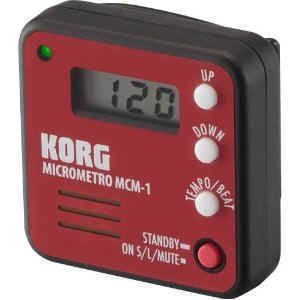 The Korg Ma30 metronome accents 1 to 7 beats plus plus duplets, triplets, triplets with middle beat omitted, quadruplets, and quadruplets with middle beat omitted. Led or beeping sound is used for temp indication. Tempo is stored after power switch is turned off. Adjustable volume control- 3 position- Soft, Loud, or Mute, selected by pressing power button. Will clip on to most clothing or music stands - maximum 1/8" thick. Uses 1 Cr2032 lithium battery, included. The Korg Ma30 metronome is packed full of features. The Screen of the Korg Ma30 metranome has a pendulum that swings back and forth, volume control, and tuning features. Another great feature of the Korg Ma 30 metronome is the tap feature.